Almost a year to the day since RunKeeper first announced its partnership with smartwatch-maker Pebble, it has finally rolled out a Pebble-connected incarnation of its iOS and Android app to let runners and cyclists access their vital stats directly from their wrist. Just to recap, Pebble is a slick e-paper smartwatch that connects to iPhone or Android, and it became only the fifth $1m Kickstarter project after just 28 hours, before breaking the crowdfunding platform’s $3.3m record with a whole month still to go. The first watches started shipping to backers in January this year, just before it launched its own iOS app. Today, RunKeeper becomes the second third-party app to launch Pebble integration, following on from Freecaddie last week, which went live with Android. But given RunKeeper is updating both its iOS and Android apps today, this will open up Pebble’s appeal to significantly more people. RunKeeper founder Jason Jacobs says the Pebble partnership is one of many integrations with hardware and fitness tracking devices in the coming months. Indeed, it already integrates with a slew of third-party devices, including Wahoo, Polar, Jawbone, Fitbit, Withings, Striiv, and iHealth via a cloud-based API. 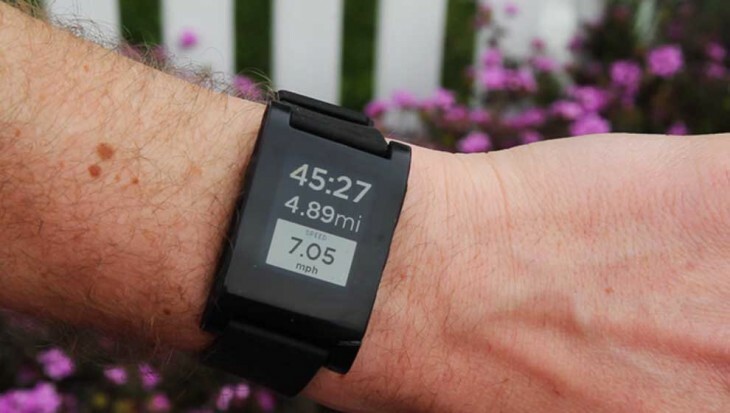 Pebble, however, represents the Boston-based company’s first tie-up that takes RunKeeper data to your wrist. Or, indeed, your handlebars. In real terms, being able to access the RunKeeper app from your timepiece means you can leave your smartphone in your pocket while out running, and you can see stats such as pace and mileage, and you can also start and stop a workout directly from your wrist. While Pebble has started shipping the watches to the original funders already, anyone can now pre-order a device through its webiste, costing $150.00. Alongside Pebble integration, the latest RunKeeper app update brings iOS into line with Android, and is now available in 6 new languages – German, Italian, French, Spanish, Portuguese and Japanese. While the latest Android version also brings new lock and homescreen widgets to give access to stats without needing to open the app. Meanwhile, check out the official RunKeeper/Pebble demo video below.